With strong stability, hard to deform. For a better compression and immobilization, helping relieve elbow pain. Polyester Mesh, breathable and not stuffy, great for hot summer! Provides a comfortable experience for your elbow. Adjustable desgin elbow splint, strong adaptability for most people. A perfect elbow protector (stabilizer) to protect your elbow while sleeping or night, good for post-operative recovery of elbow joint. Good for elbow inflammation, injuries, elbow fractures, cubital tunnel syndrome, ulnar nerve pain relief, or as PM night protector. Don't worried, any questions, contact us, please. We guarantee your 100% Satisfaction Guarantee! 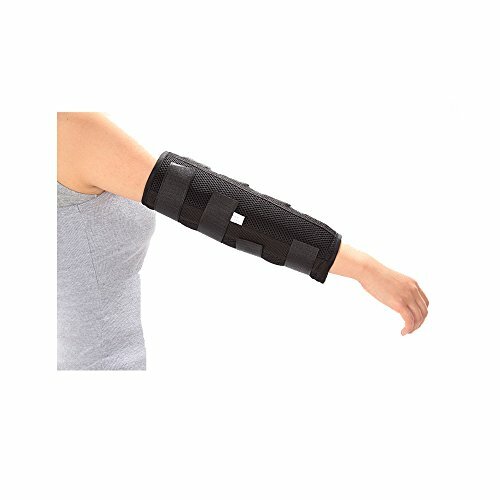 [ Perfect Elbow Protector ] This Elbow Stabilizer Can Protect Your Elbow While Sleeping or Night, Good for Post-operative Recovery. [ Breathable Mesh ] Durable and Lightweight Fabric, Provides a Comfortable Compression for Your Elbow. [ Three Metal Inner Plates ] with Strong Stability and High Flexibility, Hard to Deform, for Better compression and immobilization, Helping Relieve Elbow Pain. [ Ideal Physical Therapy Splint ] Aids in Elbow Inflammation, Injuries, Elbow Fractures, Cubital Tunnel Syndrome & Ulnar Nerve Pain Relief. [ S/M/L SIZE Options ] S for Pediatric/ Kids/ Child, and M/L for Youth/ Adult/ Women/ Men, Adjustable, Fits Right or Left Arm.